Ever since the canal had been dug in 1871, there had been a need to cross it. Several different temporary bridges had been used in the winter over the years, including a six-foot-wide makeshift suspension bridge sometimes referred to as the “old wire-rope bridge.” When the wind blew, people crawled on their hands and knees to get across. 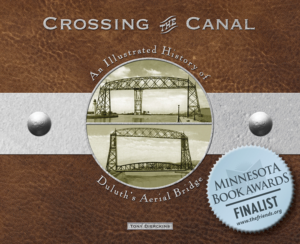 After years of disappointing efforts on the part of the City of Duluth, Pointers took matters into their own hands, and, in 1883, villages trustees named Charles Winters both superintendent of the winter bridge and the operator of the summertime ferries. The “rowboat and scow” ferry service remained in operation until 1897, when steam ferries— including the May Flower, Estelle, and E. T. Carrington—took over the job. Residents accessed the ferry from the city-owned docks located bayside north of the canal at Buchanan Street and south of the canal at the Osborne Dock on Park Point. No one expected as much of the ferrymen as did Park Point residents. Perhaps it was an effort to illustrate the need for a bridge, perhaps it was legitimate criticism, but whatever the case, Park Pointers never failed to inform city officials about poor ferry service quality. In February 1901, residents of Park Point (along with Mayor Hugo and others) complained about an incident in which a physician, Dr. Phalen, could not get return ferry service at 2:30 a.m. after visiting a critically ill patient, Mrs. Fred Granmason, on Park Point. Regulations called for ferrymen to take special care of physicians and were to be ready at fifteen-minute intervals after 1 a.m. when they knew a doctor was south of the canal. After many attempts, neither Dr. Phalen nor Mr. Granmason could alert the ferrymen, who claimed they had been wide awake all night long. The ferrymen had violated the terms of their contract, which had been awarded to C. H. Burnham in January and included $23 a day for the use of his tug Mayflower. The Common Council resolved to re-advertise for bids on the ferry contract. The owner of the ferry Estelle won the contract, and Park Pointers gave the tug a reprieve the following spring, petitioning the Common Council to keep the Estelle rather than turn to a proposed combination ferry and fire tug. The Pointers were concerned that service would be shut off whenever the tug was called to a fire. In 1903 Park Pointers penned another petition, this time asking for a much larger and “more suitable” ferry, claiming it would be “criminal negligence to continue the present service.” Despite her owner’s claim that repairs would put her in “first-class condition”—and offering to do the job for $27 a day—the Estelle lost out to the E. T. Carrington at $30 a day. 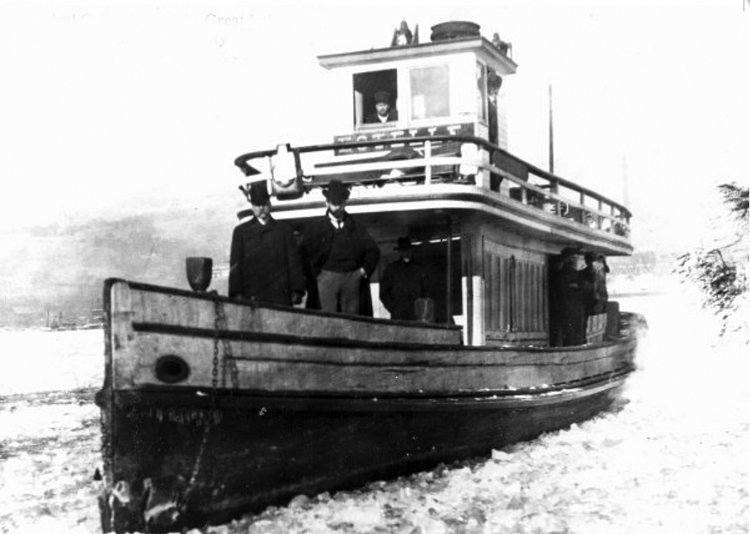 By 1905, the Annie L. Smith had replaced the Carrington and was operating the day the ferry bridge officially went into service. After that day, the Ellen D. was put in service whenever the bridge was being serviced. The Estelle was abandoned and dismantled in Duluth in 1906. The E. T. Carrington sprung a leak and sank fifteen miles from Duluth August 23, 1907.